On October 16, women gathered in the basement of Teaism to hear Bicky Corman of the EPA recount her career as an environmental lawyer. Not being overly interested in environmental law, I was only mildly interested in what she had to say. Two minutes into her account of her career, I was fascinated and inspired. Bicky didn’t have a huge life plan that she’s followed to the letter to get where she is today. She didn’t go to a top tier law school and she didn’t jump straight into high positions. She worked her way up by being good at what she did (and making friends along the way). Bicky commented that one of the most important things in building a career is not just to network, but to make friends who will think of you later. As someone who really hates networking, this was a wonderful way of framing it – and makes networking seem less scary! Throughout her career, Bicky has worked in both legislation and policy. There is a fine line between legislation and policy, but that line is not made in cement – it’s flexible. You might find yourself working on both legislating a regulation and working on policy at any given time; you don’t have to decide between the two right now. In the same vien, you don’t have to choose what your specialization is right now. You can pick up an area of expertise along the way, following what interests you and what gets thrown your way. The point that Bicky made that I really loved, was when she talked about the difference between working on a federal level and a local level. Bicky has worked for the EPA and for the District Department of Environment. Bicky remarked that at the federal level you know you’re having an impact, but at the state level it’s more visible. And because of that great feeling, since going to work for the EPA again, Bicky has stayed involved with her local community, tutoring local kids (and inspring them to be environmentalists!). Bicky was a wonderful speaker. She made thinking about planning a career seem less daunting, and really drove home the idea of getting involved in local issues in my community. I’ve been looking at my job search differently since hearing her speak, and am much less worried about finding that ‘perfect’ job right away. Each challenge will shape me and push me a direction I might not have planned on. Thanks to Bicky Corman for her wonderfully inspring talk! When starting up a business, Wilson first found her center. She planned, gathered resources, made lists, and mentally prepared herself for the tasks ahead. Next, she honed in on her intentions. What was it that she wanted to create and offer? Once she developed her plan, she created momentum and started with foundational marketing products such as business cards, a website, and a location. Finally, she generated customers and established a consistent flow. In her mind, she envisioned these steps as the stages of a yoga class, where participants find their own centers, warm up and build energy, and find their crescendos before winding down into relaxation. Wilson did not always have this peaceful approach toward business and life. Before Tranquil Space, she was stretched thin with a full-time job, part-time yoga instruction from her home, and dreams of empowering young women through movement and artistic endeavors. Just as in yoga, Wilson found her center and focused her energy on growing her passion into a viable business. She reminded us of the importance of taking a stepwise approach, because “the biggest reason for failure is trying to please everyone.” Once you have one product, you can expand and connect it to other areas of expertise within yourself or in your community. In 2006, she wrote her first book and had set the foundation for her own eco-friendly clothing line. Wilson showed us all that running your own business isn’t easy, but well worth the hard work. Her recommended reading includes The Artist’s Way, The E Myth, The Right-Brain Business Plan, Wherever you Go There you Are, Generation Earn, and Savvy Girl’s Guide to Money. She left us with a poem from Marianne Williamson, below. Thanks Kimberly for a wonderful EcoHour discussion! 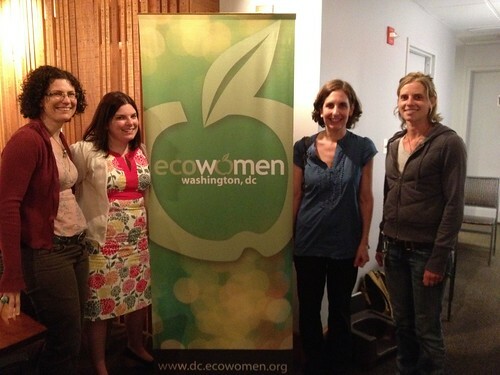 Hear her EcoHour presentation first hand and follow Kimberly’s adventures on her blog. This month’s EcoHour on January 17th features Suzanne Ehlers, the President and CEO of Population Action International (PAI). PAI is leading the charge on family planning, advocating for women and families to have access to contraception in order to improve their health, reduce poverty and protect their environment. Read her full biography on our speaker page. The idea is that reducing population growth will lead to less impact on the planet and less strain on women. Geographic locations that will be most affected by climate change in the future are generally the same areas that will see rapid population growth in the future as well. A map of this trend is available on PAI’s website. The goal of Population Action International’s work is to empower women and to address climate adaptation strategies. PAI does this by highlighting the need for reproductive justice. Global women’s rights advocacy often centers on the need for family planning. PAI takes that one step further and links family planning to environmental sustainability. Family planning has a huge impact on resource distribution and use. By highlighting the need for this, PAI brings attention to the role that women can play in reducing the impact of climate change. PAI also provides grants to reproductive health organizations in countries such as Kenya, Nepal, Malawi and Ethiopia to further promote the inclusion of gender considerations and population’s impact on climate change in national and international policy plans. Denise is running our financial planning workshop on Wednesday, January 25. Denise Bump is a Financial Advisor and partnerof Bump & Associates, a platinum financial advisory practice of Ameriprise Financial Services, Inc. in Washington DC. She has been in her current position since 2002 and has been with Ameriprise Financial since 2000. As a financial advisor focusing on working with professionals, Denise works with her clients to design a personal financial plan based on their life goals and aligned with their values. This strategy focuses on helping them become more confident about managing their financial objectives. It is designed to provide solutions to both your everyday and long-term financial questions, and is personalized to meet the needs of high net worth individuals and small business owners. As a team, she and her clients continually monitor progress towards financial goals and update their plans based on changes in market conditions and individual situations. Denise and the Bump & Associates team believe that education is empowerment. They strive to educate their clients to make knowledgeable decisions about their financial life. The clients in their practice have access to the necessary information to help them move toward their financial goals. Bump & Associates also believes in contributing to their community and offering opportunities for their clients to join them in community events.